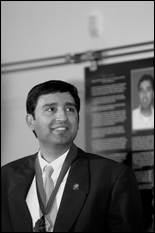 On October 16, the Clark School inducted alumnus Rajiv Laroia, M.S. ’89 and Ph.D. ’92, electrical engineering, into the Innovation Hall of Fame in a ceremony at the Kim Engineering Building attended by campus leaders, faculty, staff, students and past Hall of Fame inductees. Laroia was very active in ISR during his time at Maryland, through his advisor (now Clark School Dean) Nariman Farvardin (ECE/ISR) and their work together in the Communication and Signal Processing Laboratory. Laroia won ISR's Outstanding Graduate Student award for 1991-1992. He was one of the distinguished speakers at ISR's 20th Anniversary Symposium this past April. Farvardin and Laroia, along with Professor Steven Tretter (ECE) received U.S. Patent 5,388,124 in 1995 for "Precoding Scheme for Transmitting Data Using Optimally-Shaped Constellations Over Intersymbol-Interference Channels." Laroia has continued his relationship working with ISR faculty through the years, including M. Scott Corson, with whom he shares U.S. Patents 7,069,000 and 7,016,690. At the Clark School ceremony, Laroia was presented with a medallion commemorating his induction and a panel describing his work was revealed. Laroia is a leading developer of wireline and wireless technologies who recently sold his company to communications giant QUALCOMM. He was honored for his inventions, which helped to double the speed of data over landline modems and will allow companies to bring enhanced internet functions to mobile phones. Past Innovation Hall of Fame inductee Harry B. Smith was present at the ceremony and received his medallion as well. He was inducted in 1987 for the invention of pulse Doppler radar. The Innovation Hall of Fame induction ceremony was followed by the Charles and Helen White Symposium, where Laroia served as one of the speakers.